As “decontamination” is set to become a new bubble for Fukushima Prefecture if not for entire Japan, the national government strongly encourage citizen volunteers to “decontaminate” their own neighborhood. 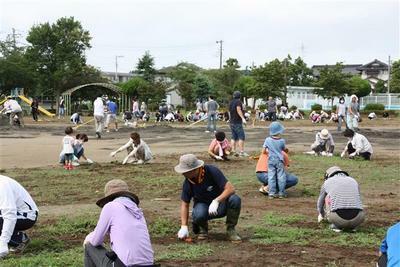 So, one elementary school in Tsukuba City in Ibaraki Prefecture called on the parents to do the “decontamination” of the school yard on September 9, and Ibaraki City proudly posted the photographs of the occasion on its webpage. Except… oops one of the photos showed the presence of small children. It was supposed to be done by adult volunteers only, for the safety for the kids. People started to question the wisdom of “decon” with children, so the city quietly substituted the photo with the one without any children in it. What were these parents thinking? Well I guess they couldn’t secure babysitters. Or they thought this was some kind of family fun activity. Probably the answer was that they weren’t thinking. Why did the school do this nearly useless “decontamination” which hardly reduced the radiation level except under the gutters and in the ditches? Probably to “alleviate fear and anxiety” among parents, as every single politician and bureaucrat in Japan spouts these days. Now the school is all set for its annual autumn school athletic meet. It’s all in your head, they say. I still occasionally see some tweets by people from high radiation areas saying “We’ll adapt to high radiation quickly, won’t we? After all, there are locations in the world with 10 millisieverts/year radiation!” Well, according to Dr. Alexey Yablokov (link is PDF file), it takes about 20 generations or 400 years for people to become less sensitive to radiation effect.